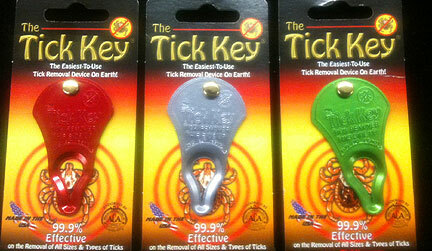 TickKey is proudly Made in CT and has proven to be the premier tick removal device on the market. TickKey was invented in Watertown, Connecticut after several years of designing & redesigning. Since then, it has been tested over and over again on both, people and pets, and has proven to be the premier tick removal device on the market. We are excited to offer you this unique Patent Pending Design, constructed of sturdy machined anodized aluminum, at all levels of the consumer market. A product that is proudly manufactured in Connecticut (USA). We, at TickKey are committed to bringing you the highest level of customer service and client support. We are concerned with the health and well-being of our families and pets. We know that you are equally concerned about your family, pets and friends. And, we are quite aware of the many diseases that ticks can carry. We are also in tune with the danger that can come from improper removal of ticks... everything from the long, drawn out problems of trying to entice the tick to leave its host by using methods such as petroleum jelly, heat, etc. causing the tick to expel toxins into its host to the fear of using tweezers and not removing the tick's head. Whether you are looking to purchase tickkey to add to your inventory or for your personal use, you can be sure that we will stand by our commitment to you -- the highest level of customer service with the premier tick removal device on the market.